Moving workloads to the cloud is either a reality or a near-term goal for an overwhelming number of enterprises. For most organizations, optimizing cloud use to improve operational efficiency and achieve cost savings is the primary objective. But navigating cloud adoption is a complex process that requires careful planning and analyses to achieve desired economic goals and ensure success. It’s a technology decision that has significant impact on the business. Economic benefits vs. costs must be accurately estimated and carefully weighed before making a move to cloud…not just for the cluster, but for every workload queue. This webinar will take the guesswork out of calculating cloud migration costs and provide you with the detailed analyses you need to make fully-informed technical and business decisions before embarking on your cloud migration journey. - How accurate are my cloud migration and long-term deployment cost estimates? - What queues will be more cost-effective in the cloud, and which ones are better left on-premises? - What AWS, Azure, Google, or IBM cloud instances will work best for each of my queues? CPU-optimized? Memory-optimized? General purpose? - How can I help my team to make a successful transition to deploying workloads using the public cloud? technologies. However, many organizations that are migrating to the cloud focus on technical factors and overlook the broader business implications of their projects. As a best practice, assessing the opportunities and risks for the organization should be a joint effort led by the IT and business unit teams. At the highest level, a business justification focuses on the return on investment (ROI) associated with a proposed technical change. However, many supporting data points are required to populate the formula and achieve a realistic calculation. What are the key business expectations associated with a cloud migration? What are the implications if the cloud migration doesn’t go as planned? What business considerations should be included in any cloud migration plan? And always, this webinar will be followed by a short Q and A session with the audience. Please join us! Pepperdata has engineered a big data APM solution that empowers operators to automatically optimize the performance and capacity of their big data infrastructure while enabling developers to improve the performance of their applications. Unlike other APM tools that merely summarize static data and make application performance recommendations in isolation, Pepperdata delivers complete system analytics on hundreds of real-time operational metrics continuously collected from applications as well as the infrastructure — including CPU, RAM, disk I/O, and network usage metrics on every job, task, user, host, workflow, and queue. The result is a comprehensive, intuitive dashboard that provides a holistic view of cluster resources, system alerts, and dynamic recommendations for more accurate and effective troubleshooting, capacity planning, reporting, and application performance management. Pepperdata diagnoses problems quickly, automatically alerts about critical conditions affecting system performance, and provides recommendations for rightsizing containers, queues and other resources. Leveraging AI-driven resource management, Pepperdata tunes and optimizes infrastructure resources to recapture wasted capacity and get the most out of the infrastructure. Welcome to the new world of real-time big data application and infrastructure performance management. Optimize your infrastructure, your applications, and your time — at scale. Pepperdata Application Spotlight is a self-service APM solution that provides developers with a holistic and real-time view of their applications in the context of the entire big data cluster, allowing them to quickly identify and fix problems (failed Spark applications, for instance) to improve application runtime, predictability, performance and efficiency. Bottlenecks are a fact of life in IT. No matter how fast you build something, somebody will find a way to max it out. But bottlenecks can be crippling to organizations whose business operations depend on reliable and consistent service levels. Deploying an application performance management (APM) solution optimized to address big data challenges is essential for rapidly identifying and overcoming congestion within operational environment. For most enterprises, APM is considered an essential element of IT operations, bridging production and development with IT and digital business. As companies invest in new technology and projects in their digital transformation journeys, it’s critical to understand the ROI value of those investments. This webinar will look at eight ROI benefits of APM — both financial and non-financial — that organizations need to consider when evaluating APM solutions. These include increased developer productivity, reducing downtime, improving business continuity and more. “There is no tolerance for downtime in healthcare, which is why we bought Pepperdata. We started using Pepperdata on day one because Pepperdata instruments and monitors the resources as well as the applications running on the Clearsense Platform. While businesses are deriving tremendous insights from ever-growing big data sets, development teams are challenged with increasingly resource-hungry workloads and overwhelming bottlenecks that impact productivity. This makes big data application performance management (APM) a must-have in today’s ecosystem. Join us to learn how APM can help enterprises overcome development and performance challenges associated with growing big data stores. BI workloads are an increasingly important part of your big data system and typically consist of large queries that analyze huge amounts of data. Because of this, BI users frequently complain about the responsiveness of their applications. Learn how Pepperdata enables you to tune your big data system and applications to meet SLAs for critical BI workloads. Clearsense is a healthcare technology company that helps its customers realize measurable value from data with real-time analytics. Clearsense collects patient information — from monitors, ventilators and other biomedical devices — and provides real-time views of patient conditions and changes for early detection and prevention. With no room for downtime, Clearsense relies on Pepperdata to help them ensure uptime and optimize application performance. Join Pepperdata and Clearsense Chief Innovation Officer Charles Boicey for this informative webinar. – Reduced mean time to problem resolution. – An accurate understanding of the most expensive users. – Improved platform throughput, uptime, efficiency and performance. Alex Pierce joined Pepperdata in 2014. Previously, he worked as a senior solution architect at WanDisco. Before that, he was the senior solution architect at Red Hat. Alex has a strong background in system administration and big data. – Improved throughput, uptime, efficiency and performance. – Deploy capacity accurately for predictable performance. – Recapture wasted resources to maximize current infrastructure. Kirk joined Pepperdata in 2015. Previously, he was a Solutions Engineer at StackVelocity. Before that he was the lead technical architect for big data production platforms at American Express. Kirk has a strong background in big data. – Improved application performance and efficiency. – Insight on cluster events impacting applications. Alex joined Pepperdata in 2014. Previously, he worked as a senior solution architect at WanDisco. Before that, he was the senior solution architect at Red Hat. Alex has a strong background in system administration and big data. Despite tremendous progress, there are critically important areas, including multi-tenancy, performance optimization, and workflow monitoring where the DevOps team still need management help. • How Pepperdata Cluster Analyzer helps operators overcome Hadoop and Spark performance limitations by monitoring all facets of cluster performance in real time, including CPU, RAM, disk I/O, and network usage by user, job, and task. • How Pepperdata adaptively and automatically tunes the cluster based on real-time resource utilization with performance improvement results that cannot be achieved through manual tuning. Continually tuning your applications isn’t the best APM scenario for big data developers. This webinar discusses how big data operations performance management (OPM) provides the necessary context for more robust APM. A routine element of running a big big data platform is hardware. The OPM resource usage metrics that provide operators with clarity when something is not a clear cut bottleneck in the realm of CPU, memory, IO performance, are also extremely useful to developers as well, and can provide them with notifications and alerts for hardware related issues like network errors on a specific network interface. This webinar discusses how big data total performance management (TPM) combines operations performance management (OPM) and applications performance management (APM). Pepperdata® Application Spotlight is a self-service APM portal that provides developers with a consolidated view to improve troubleshooting and optimize application performance. Application Spotlight enables big data application developers to quickly and easily improve performance with more relevant application information, performance recommendations, insights, and calls to action, all in one place. In addition to helping them make their jobs go faster, Application Spotlight enables developers to be better tenants in multi-tenant clusters and shows them how to write optimal performing jobs and more efficiently use their queue and cluster resources with practical, innovative application performance management solutions. Pepperdata Application Spotlight analyzes all Hadoop and Spark jobs running on the cluster and provides developers with technical insights on how each job performed. Intended for software engineers, developers, and technical leads who develop Spark applications, this webinar demonstrates how Application Spotlight helps developers quickly improve application performance, reduce resource usage, and understand application failures. Kirk Lewis joined the Pepperdata team in 2015. Previously, he was a Solutions Engineer at StackVelocity. Before that he was the lead technical architect for big data production platforms at American Express. Kirk has a strong background in big data. This webinar will present the results of analyzing many Hadoop and Spark jobs on many multi-tenant production clusters. We will cover common issues seen, the symptoms of those issues, and how to address them. We will discuss the Pepperdata APM solution and discuss best practices for diagnosing application failures and errors. Pepperdata has gathered trillions of performance data points on production clusters running Hadoop and Spark, covering a variety of industries, applications, and workload types. We will present key performance insights — best and worst practices, gotchas, and tuning recommendations — based on analyzing the behavior and performance of millions of applications. –How Spark scheduler can still provide HDFS data locality on Kubernetes by discovering the mapping of Kubernetes containers to physical nodes to HDFS datanode daemons. –How you can provide Spark with the high availability of the critical HDFS namenode service when running HDFS in Kubernetes. Pepperdata makes Hadoop+YARN based systems better by providing total performance management (TPM) for big data. Total performance management is the combination of application performance management (APM) and operations performance management (OPM) in a single package so developers and operators can rely on the same underlying information to build and operate highly performant big data applications in multi-tenant clusters. For developers, the Application Spotlight self-service APM portal surfaces applications that need attention from a performance perspective. For these applications, Application Spotlight provides precise recommendations to improve performance, automatically identifies bottlenecks and makes it easy to analyze root cause of errors and failures. For operators, the Cluster Analyzer OPM solution makes it easy to identify applications and users causing issues on the platform, proactively alert on those issues, and improve cluster performance. We also have roll up reports for things like chargeback and capacity planning. The Capacity Optimizer add-on module automatically increases cluster throughput 30-50% by addressing some of the inefficiencies of how YARN does resource management today. Join us for this webinar presented by Alex Pierce and learn how we can bring performance management to your applications and your cluster. This is a webinar that discusses the limitations of manually tuning Hadoop and how Pepperdata Improves YARN and the ResourceManager. Pepperdata solutions are certified for use with Cloudera, Hortonworks, and MapR. Sometimes we are asked, Doesn’t YARN already do this? The answer is that Pepperdata does not replace YARN or the ResourceManager, but can significantly augment its capabilities. This webinar discusses the limitations of manually tuning Hadoop and how Pepperdata improves YARN and the ResourceManager. Pepperdata is the Big Data performance company. Fortune 1000 enterprises depend on Pepperdata to manage and optimize the performance of Hadoop and Spark applications and infrastructure. Developers and IT Operations use Pepperdata soluions to diagnose and solve performance problems in production, increase infrastructure efficiencies, and maintain critical SLAs. Pepperdata automatically correlates performance issues between applications and operations, accelerates time to production, and increases infrastructure ROI. 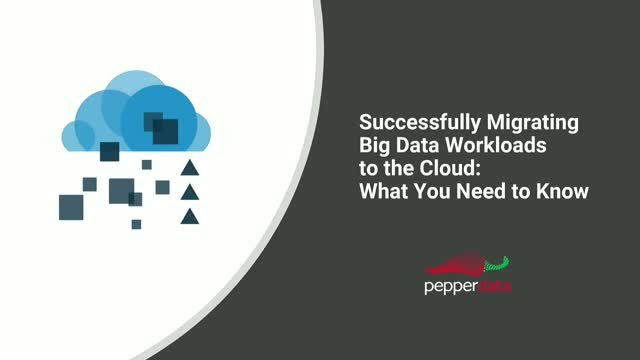 Pepperdata works with customer Big Data systems on-premises and in the cloud.